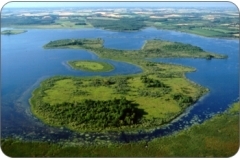 Located in the Luther Marsh Conservation which includes 1400 hectares of open marsh, known as Luther Lake. The lake supports 12 different species of minnows. The highly diverse habitat is home to numerous nesting birds and waterfowl. Whether shore fishing from the dam or east launch, or canoeing the lake, this tranquil setting offers tremendous wildlife viewing opportunities.